LAPD detective Jacob Lev sounds – and probably feels – like a bit of a cliché. Single, overworked and a borderline alcoholic, he habitually lets down his blind father Sam, promising to visit then letting work get in the way. Not that his work is interesting any more. Depressed and exhausted, his bosses have reacted to his failing productivity by demoting him to a dull job in the traffic division, crunching numbers that seem to have no effect on anything. Then, one morning, he awakes to find a beautiful brunette in his shabby apartment, who he has apparently spent the night with yet cannot remember meeting. As she leaves, an even greater mystery is about to enter his life – the news that some unspecified aspect of his skill set has seen him transferred from traffic into Special Projects, a unit that apparently no one else has heard of either. Newly equipped with a secure satellite phone and a set of bizarre procedural orders, Jacob is immediately assigned to a case in the Hollywood hills: an isolated abandoned house containing the severed head of an unidentified man and a single word etched into the kitchen counter, the Hebrew for “justice”. This is, then, Jacob’s special skill – his Jewish background. Unsure whether to be insulted, flattered or worried that a killer from within his own community may be on the loose, he sets out to follow the trail of clues, such as they are. Along the way he unearths the inevitable serial killer, but also catches onto something altogether more mysterious, that leads him first to Prague and then to Oxford, via an ancient Jewish legend. 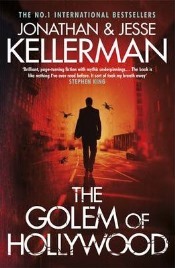 The Golem of Hollywood is the first collaboration between the independently successfully father and son novelists Jonathon and Jesse Kellerman, and combines the police procedural and supernatural elements that the writers respectively work in. These are both genres that I generally enjoy reading, and while a cross-over story is nothing new, I had high hopes that writers of such pedigree would have something new to offer to this increasingly popular field. The incorporation of the golem legend into literature has, of course, been done before in various forms (Terry Pratchett’s Feet of Clay springs to mind), the golem seemingly a creature beloved of writers. Perhaps this is because the golem is brought to life with a writer’s lifeblood – words – and is something that can be sinister or protective, menacing or obedient, giving them plenty of literary potential. In this novel, we have a tale running parallel to that of Jacob Lev throughout the narrative: the origin of the famous golem of Prague, told from the creature’s perspective. For anyone who might have heard of golem and idly wondered where the life spark or soul that fills the creature may have come from, here we have an intriguing answer. I liked the idea, although the execution did not work as well as I might have liked. The writing in Jacob’s chapters was quick, witty and bright, with the odd surprisingly poetic turn of phrase. It was well constructed, with some excellent dialogues in particular, and the authors leading the reader on a merry dance, at times letting us smugly think we were a step ahead of the narrative, only for us to be reeled back in a chapter or two later as we realise that our conclusions are pre-emptory. In contrast, it was as if someone else wrote the golem chapters, and someone not half so good; stiff, stilted and at times a touch confusing, I found the desire for a different tone in these sections disruptive to the flow of an otherwise absorbing mystery story. The Golem of Hollywood is an original but flawed novel, perhaps not warranting the price of a hardback copy, but fans of either author or of a good supernatural mystery are likely to be rewarded by checking this out in paperback. Recommended (just not at the fill £19.99 price). No Comments on "The Golem of Hollywood"